If you're looking for a company's proof of authentic essiac, you've come to the right place! 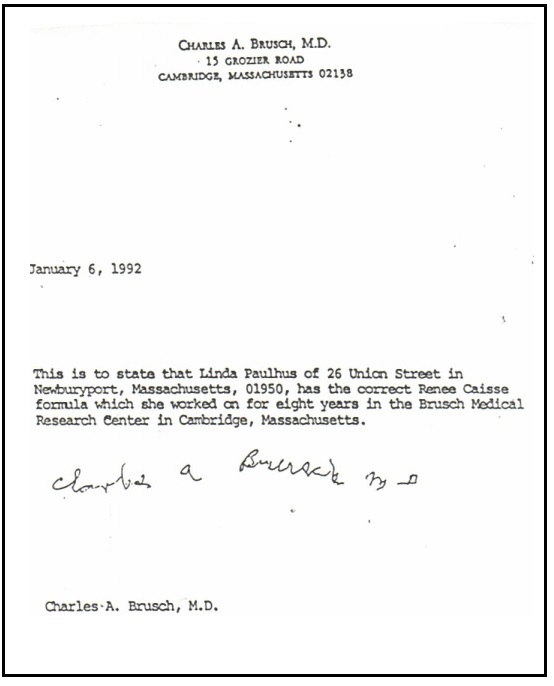 Here we have a timeline describing our connection to Rene Caisse and Dr. Charles Brusch from the Cambridge Medical Research Center shown here through photo, video and some important documents. Please note: the sheep sorrel in our essiac contains the entire root. It's 20% root. Rene Caisse and Dr. Charles Brusch. Please scroll down for the rest of the story! Many companies fraudulently claim to have proof of authentic essiac yet provide no evidence to back up their claim. The following pictures and documents provide UNDENIABLE proof of our connection to the original source of all AUTHENTIC essiac, Canadian nurse Rene Caisse. 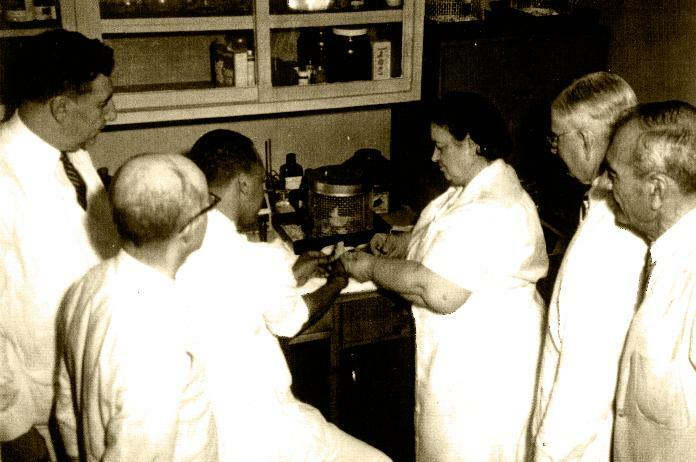 Dr. Charles Brusch (left) and Rene Caisse (3rd from right) performing laboratory tests on eight-herb essiac in Cambridge, Massachusetts. The formula includes the sheep sorrel roots (20% root). 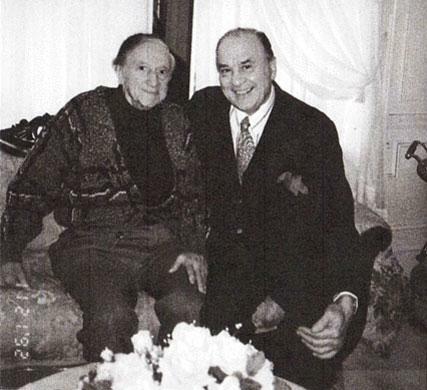 Dr. Charles Brusch (left) with longtime friend and Attorney George Brankey (right) at Dr. Brusch's home in Cambridge, Massachusetts. 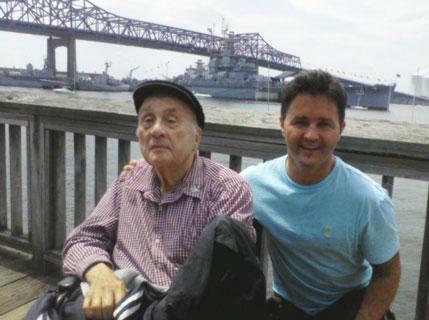 George Brankey (left) and discount-essiac-tea.com owner Bryan Paulhus in Boston, MA in July of 2012. 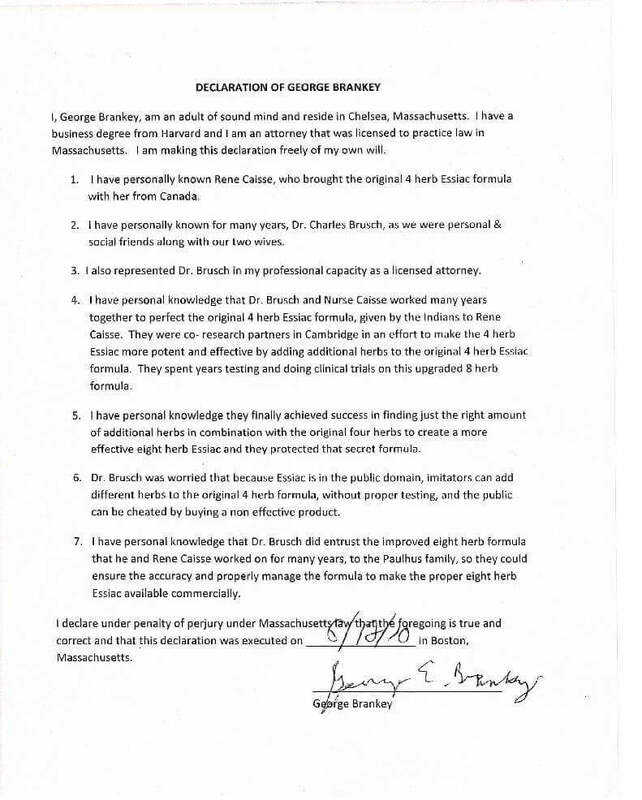 Declaration of Authenticity: Below is the statement from George Brankey declaring the Paulhus family's connection to Rene Caisse, Dr. Brusch and the authentic 8-herb essiac formula. In spite of all the proof above, we still want you to feel even more confident with your essiac tea purchase. We understand that many people waste a bunch of time and money on alternative treatments with disappointing results. We don't want to impose that on anyone. Therefore, we cover our product with a Guarantee so that you can be confident and protected when you choose to try our product. Click here to read more about our Money Back Guarantee.